My Application Was Approved! Yey! My PhilWeaver Application at http://philweaver.net was approved in just a matter of minutes. I thought it will take 2 to 3 weeks for my application to be reviewed and accepted. But I was just accepted instantly, that’s why I’m so happy to be one of these great Filipino Web Designers and Developers! (Naks parang anong achievement no? Account registration lang pala.. hehehe). Pero, atleast may nagawa ako ngayon araw, kesa naman wala diba? Check out my online profile at PhilWeavers Dot Net by clicking this direct link HERE. Tatlong website pa lang ang nandiyan, and I have no online portfolio yet, compared to other professional graphic designers and developers that are registered in the said website. You can find various talents in that site, andyan yung mga gumawa ng mga sikat na website dito sa Pilipinas (hehe). 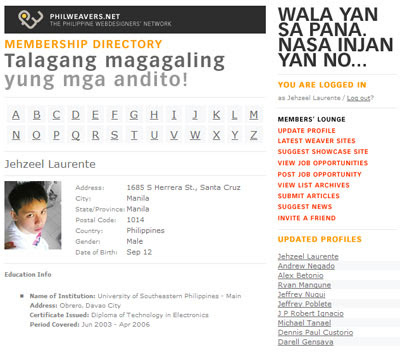 Just browse the online profiles one by one, and you can see different talents, fascinating works, and marami pang iba. At pahabol, may bago ulit me online account, iba nanaman to, ngayon ko lang din to nakita, thanks to Helene for inviting me at Flixster! Kung movie addict ka, register na, and answer The Never-Ending Movie Quiz! You can also view my ugly Flixster profile here! Yan lang po for today… babush! babush? hahaha.. and since when did you learn that word? ehem… kaw ha.. my instincts were right. i should have told elve. hehehehe… just kidding. congrats! hey.. eto sasamahan kita. i checked your profile, nice nice. yey salamat sa mga cute na taong nag comment! weeeeeeeeee! Impressive! And love your DOST-SEI icon too! Very much! I have a good feeling you’ll make it big someday. And I kid you not! More power kabayan! thanks kabayan! more power to you also! weeeeeee!